Rattus rattus Linnaeus (a comical scientific name) commonly known as roof rats are likely to form habitat on a higher level from the ground like walls, attics. A roof rat is also generally called a black rat, ship rat or sometimes an old English-rat. Their fur do sometimes exhibit several color forms from black to brown with a lighter underside. Roof rats are not much common they are particularly found within 100 miles of the gulf coastline of the Western United States. In case of their natural habitats they are more likely to be found on trees , among vines on fences, in parks and in industrialized areas. Folks also refer this specie as black rats. These rats have a longer tail and a slim body, larger ears and eyes and a more sharp or pointed nose as compared to the Norway rats. They usually weigh between 5-8 ounces and measures from 12-18 inches Iong.This rat species produces five to eight baby rats per litter and are likely to live 1-2 years. They become sexually mature in just a couple of months. Females become sexually mature in 68-90 days.Similar to squirrels roof rats use their tales that grow to be longer than their bodies to balance as they walk across the electrical wires. These species are expert in climbing and more brisk than Norway rats. Roof rats are mostly eat everything. Roof rats generally prefer to eat wheat, rice, corn, seeds, vegetables including fruits and invertebrates. These species are an exceptional nuisance to farmers as they eat agricultural based crops like sugarcane, grains and cereals. Roof rats are also pretty suspicious be patient in trapping and baiting as it may take a few days for them to adjust to a new change in the environment and take the bait or get trapped. Peak times for roof rat activities is at dawn or dusk; they are nocturnal and come out at night. If they are heard during the day then their population is Iarge. 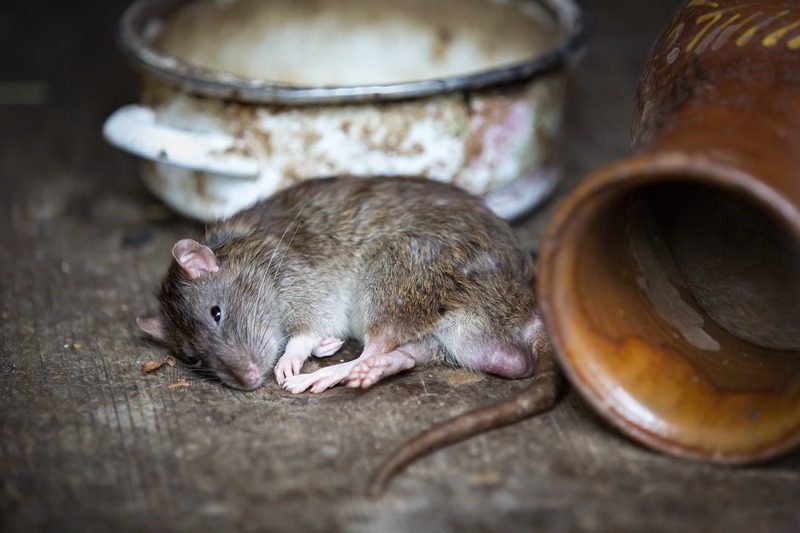 There are various diseases that are caused by roof rats which includes Hantavirus Pulmonary Syndrome (HPS), Murine Typhus, Rat Bite fever (RBF), Salmonella Enterica Serovar Typhimurium, Leptospirosis, Eosinophilic Meningitis, Rickettsialpox.The Norway rat is more common of two rodent species. Unlike the roof rats the Norway rat (a scientific name Rattus norvegicus) prefers to be underground but these species can be found in a variety of places including under buildings, in dumps and on farms. This type of rat has been given a number of other names which includes a brown rat, sewer rat, common rat, street rat or also wharf rat. These species tend to look more well-fed and rounder than roof rats with small eyes, close-set ears and a shorter tail. As Norway rats tend to be larger, their droppings are also larger-about 3-4 inches long. Whereas roof rat droppings are usually about half an inch. Norway rats are exceptional swimmers. Rats can make their way into your plumbing by squeezing their way into your toilet’s water seal and escaping out from your toilet bowl. This species prefer to move over flat surfaces although they can also climb when required. This species will often enter your property at the foundation or even below the ground. Although both of the species will eat whatever is available. The Norway rat likes to eat more protein and carbohydrate-rich foods including meat, sugar, beans, bread and in rare cases even injured rats.lf you don’t see the the rat itself, another way you can tell one of these species is nearby if you notice droppings, tracks, burrows, gnaw marks, sounds and smudge marks left by their oil and dirt.ln case of diseases caused by Norway rats, it particularly includes hemorrhagic fever with renal syndrome, leptospirosis, Lyme disease, the plague, rat-bite fever, salmonellosis and tularemia which can lead to severe health concerns. The difference between roof rats and Norway rats is all about where they like to live in addition to the differences in their physical appearance. Scratching, whining, shrieking and bickering roof rats brashly publicize their existence in the rafters, attics and kitchens they live in. Norway rats circulate in basements and lower levels of buildings, culverts and tunnels.